When Charles Tiffany And John Young first hit on the idea for a stationery and fancy goods emporium in 1837, it’s unlikely even they realized what an icon the Tiffany brand would become. Following continued growth of the company throughout the first 20 years, in 1853 Charles Tiffany took control of the company and re-focused the product line on jewelry. This, in turn, led to the first “Tiffany Setting” diamond ring in 1886, a method which became the leading standard for engagement ring design and manufacture. Prior to 1886, diamond rings had the center stone in a bezel setting which, although generally a very secure setting, also served to hide at least half f the diamond below the height of the bezel itself. The Tiffany setting called for a prong setting to allow the diamond to sit higher and therefore reflect more light. By showing more of the diamond, it would appear bigger and brighter than had previously been attainable with a bezel setting. So successful was the new setting design, that the name became associated with any multi-prong setting, a trend which continues to this day, despite Tiffany & Co having been granted a US patent which means only those rings made by Tiffany’s can truly be described as a “Tiffany Setting”. Traditionally, a Tiffany & Co engagement ring will be a solitaire, meaning only a single diamond is used, rather than multiple stones. Tiffany do produce a range of diamond engagement rings which go beyond having a single diamond, but the usual reaction when hearing of a Tiffany engagement is to picture an exquisite solitaire diamond ring. As well as the exceptional standards of manufacture in all Tiffany Products, the diamonds themselves are only selected if they meet very exacting standards as set by the company gemologists. Ordinarily, if a precious stone is considered worthy of inclusion in fine jewelry, it is classed as gem grade but, despite this, Tiffany & Co gemologists reject 99.96% of gem grade diamonds, insisting on using only the very finest diamonds in Tiffany engagement rings. During the 1940s, diamond mining company De Beers launched an ad campaign which convinced Americans that “A Diamond is Forever”. As sales of diamond rings rose by 55% in just a few years, Tiffany & Co were able to cement their place as the number one producer of diamond engagement rings for the discerning couple. As a result, Tiffany engagement rings have since become the single most popular diamond ring in the world, coveted by all who see them. Today, Tiffany continues to be the authority of diamond engagement rings. Other producers may match Tiffany in quality, and even beat them on price, but when asked where the ring came from, “It came from Tiffany & Co” is still the answer everybody would love to give. 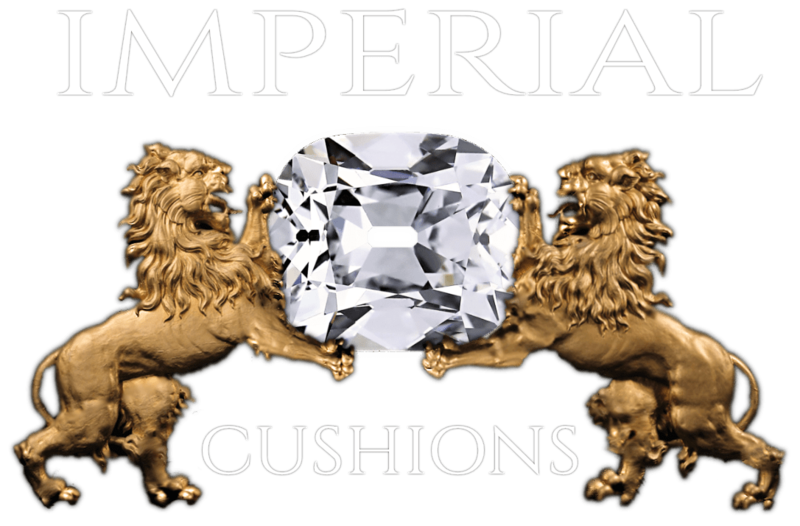 Copyright © 2019 Imperial Cushions, All Rights Reserved.